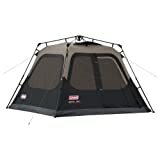 Coleman 4-Person Instant Tent – Just $74.99! It is probably time to camp somewhere today – just not where I am! How about you? I can’t wait for summer and camping and out door fun. Here is a great deal on a tent for that summer fun – great deal!